Harris Products Group, a leader in metal working products used in the brazing, soldering, welding, cutting and gas distribution industries, is a wholly-owned subsidiary of The Lincoln Electric Company. 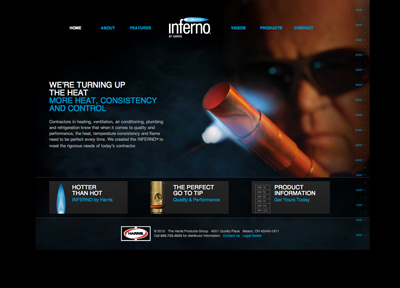 Inferno by Harris product featured innovation in torch tip design that allowed for better heat and control of flame for soldering and brazing. To get the word out quickly and to increase the likelihood of industry buzz around the new product at industry trade show, the company developed a video and viral media and collateral materials: Sell-in sheet; poster; video; new packaging; micro web site; and, demonstration samples were made available. The materials allowed authorized representatives to feature the product and therefore produced increased company sales. Launch materials and a systematic approach to wholesaler organizations lead to a powerful positioning against the industry HVAC torch leader. The campaign provided a compelling argument for the Inferno by Harris. Theme “Now that’s a hot tip.” was battle cry as the product became available to industry reps.